Duck hunting is a tradition that goes back hundreds of years and Lost Quarter Farms in Mendon, Missouri is happy to provide a place where families can begin and continue their tradition of duck hunting. Whether you come alone or with your family, our accommodations are homey with warm, family-style meals limiting the distance between you and wherever you call home. Lost Quarter Farms is the premier duck hunting lodge in the Midwest and is proud to be the destination of hunters from all over the globe. 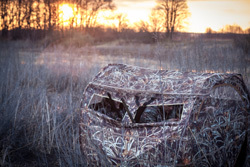 The beautiful, tranquil scenery offers a variety of hunting locations with varying difficulties to attract beginner through expert-level hunters. If you are in a group of hunters who have little practice with safety and hunting etiquette, it is recommended, though not mandatory by Missouri Fish and Game, that you bring bright orange vests to ensure the safety of your party. Duck hunting at Lost Quarter Farms is always a fruitful proposition. Our lush fertile lands attract many different species of duck for our hunters to choose from. Enjoy a peaceful day out on the waters solo or with a party of your closest friends. Duck hunting is always a good choice for those people who are just getting into hunting, so schedule with us today to reserve your spot at one of the most talked about hunting lodges in the Midwest. Duck season is always a time of excitement and fun, so bring the whole family as you explore the land and become one with nature. As a courtesy to our guests, we even pack up your birds as a complimentary gift. Contact us today to schedule your reservation! We look forward to meeting you and your family!